Acupuncture creates micro-trauma to tissue which the body responds to by initiating healing activities, neurologic rebalancing processes, and pain relieving activities. Our bodies are designed to keep a clear boundary between our body and our environment. The skin is a shield, preventing external objects from entering inside the body. The interior of the body is precisely organized, it cannot allow random things to enter into the body and create chaos. Most of our internal tissues have never been touched by an external object ever before. Acupuncture is a therapy which does use an object to penetrate through the skin and enter into the internal environment and touch tissues inside the body. A very thin sterile needle is used. When a needle penetrates through the skin and touches muscle (or other tissue), the body responds to it as a healing crisis and cascades of healing activities, pain relieving activities and neurologic rebalancing processes follow. The body responds to the needle with a local increase of blood circulation and cascades of chemistry that initiate tissue healing and regeneration. 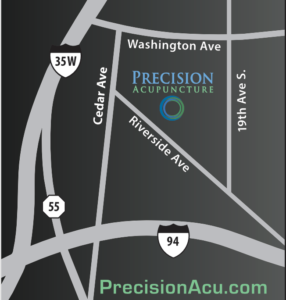 Since needling into the body activates healing activities, acupuncture is performed by locating the injured body part, the body part that is not properly and/or the body part that is chronically not fully healing and needling into the tissue, around the tissue, and/or other tissues that are interrelated. This increases healing activities in the areas of concern. Acupuncture is an effective treatment for promoting healing of various body tissues including muscle, tendon, connective tissue, ligament, nerve, and so on. A series of treatments over time brings optimal results by promoting healing activities to continue over the time it takes to fully heal. The immediate effect experienced when receiving acupuncture tends to be pain relief, anxiety relief, depression relief, followed by a good nights sleep. Acupuncture heightens the persons sense of wellbeing and supports good sleep. When a needle penetrates through the skin, nerves respond by sending signals to key neurologic sites in the brain and spinal cord. These signals activate various nerve pathways, stimulate the release of various chemistry and activate neurologic rebalancing/modulating responses. Acupuncture changes nervous system chemistry & behavior. When acupuncture is done in a series over time, pain relief and neurological rebalancing accumulates. These processes are known to be a part of how/why acupuncture is so effective for acute pain, chronic pain, depression, anxiety, insomnia and various other health concerns. Pain, muscle weakness, muscle stiffness & tightness, limited range of motion and uncoordinated muscle movements are often the result of groups of continuously contracted muscle fibers. These are tight bands of muscle tissue. It’s not the entire muscle, but a group or groups of muscle fibers that are in constant contraction. When they are in constant contraction, they limit flexibly & range of motion, they reduce muscle strength (they are fatigued), they cause improper muscle firing patterns, and they generate inflammation and pain. These tight bands are referred to as Myofascial Trigger Points. Needling these tight bands of muscle is incredibly effective in releasing them. It is known to be the most effective way of eliminating them. Needling the myofascial trigger points stimulates a nervous system response that activates the tight muscle to release, lengthen and return to proper tone. This eliminates the inflammation and pain, and brings the muscle’s strength, flexibility, and range of motion back as well as proper coordination of muscle movement patterns back. Needling muscles is a great way to not only get people out of pain and regain function but also enhance athletic performance. Athletes are continuously surprised at how much more strength, flexibility, & range of motion they have after needling appropriate muscles. The immune system also responds to anything that penetrates the skin. The needling initiates an immune response locally and initiates a system rebalancing of immune system activity from the nervous systems response to the needling. The local nerves respond to the needling stimulus by sending signals to key sites of the central nervous system which result in an immune system modulation/regulation. It is observed that acupuncture activates the immune system to rebalance, harmonize and function more optimally. Patients are routinely surprised at how quick and effective acupuncture is at relieving allergies, sinus congestion, runny nose, and symptoms of asthma. Acupuncture also frequently prevents/decreases the occurrence of outbreaks of allergic asthma, allergic sinusitis and other forms of allergies. When patients receive regular acupuncture care they frequently enthusiastically report that they no longer catch cold, flu, bronchitis or have asthma attacks nearly as frequently as they did prior to regular acupuncture care. When a needle penetrates the skin, the nerves local to the needle send messages to the brain and stimulate changes in brain activity in key areas of the brain that control the endocrine system. Acupuncture activates a rebalancing of the endocrine system and is well known to bring regularity to menstrual cycles and promote fertility. The body responds to a needle penetrating the skin as a healing crisis, with tissue healing/regenerating activities, pain relief, & nervous system rebalancing processes. Tight muscles respond to needling by lengthening, softening, and return to proper tone. The muscles regaining their flexibility, strength and performance. Acupuncture eliminates sources of inflammation. Acupuncture has an immediate observable pain relieving and anxiety relieving effect. Acupuncture relieves mild to moderate depression and is frequently effective in relieving insomnia. Acupuncture is an effective therapy for the treatment of acute pain, chronic pain, injuries and a wide range of other conditions. Acupuncture is also an excellent therapy to maintain wellness and to enhance physical/athletic and mental performance. Acupuncture activates the body to heal itself!